Staying up to date on industry standards and engine service techniques for the latest engine models can be a challenge. With emissions standards and engineering practices constantly evolving, engine technicians need proactive training and mentorship in order to stay ahead of the engineering curve. At Perkins Pacific, engine technicians can sharpen their craft and learn about the latest Perkins engine practices in our state-of-the-art training facility. Perkins Pacific’s team of highly-trained instructors provide complete Perkins engine training to service technicians in our dedicated classrooms and workshops in Ridgefield, Wash. Offering courses that cover the latest training aids, equipment and service techniques, Perkins Pacific gives technicians hands-on experience with the latest products and service techniques for all Perkins engines. 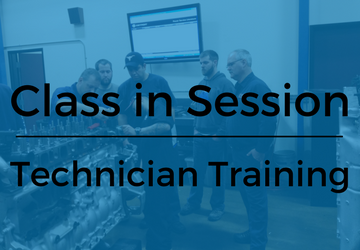 Technicians receive training in courses that simulate real-world scenarios and dive deep into applied failure analysis, engine diagnostics, engine teardowns and emissions regulations – offering advanced insight into Perkins engine operation and maintenance. Taught by award-winning instructors with small course sizes and tailored course design, it is possible for every Perkins engine technician to learn something new and continue to expand their service knowledge. Interested in broadening your Perkins engine service knowledge? Visit our training page to view our available courses, enrollment details and a training schedule that fits with your work schedule.